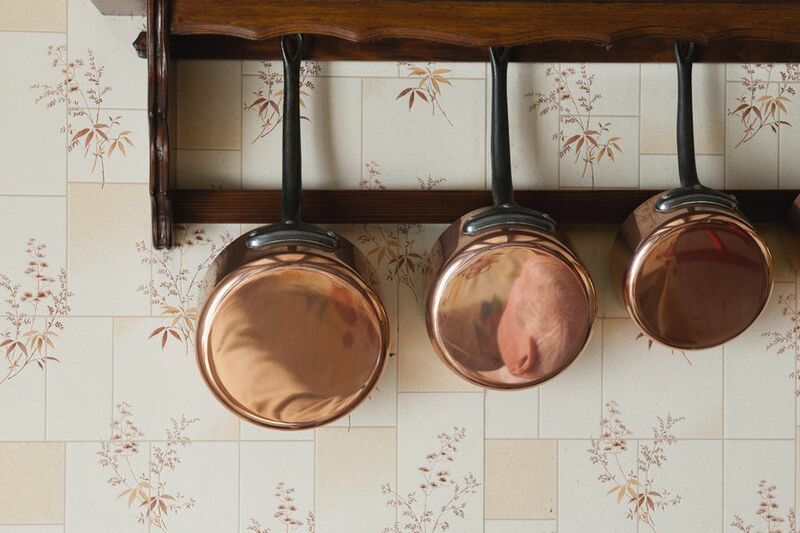 Copper is a wonderful material in decorative cookware and other household items. Copper's excellent heat conduction makes it ideal for pots and pans. Artisans appreciate its malleability and warm look, as well as its burnished color. Over time, though, copper can get dingy and covered with oxidation, and some people even shy away from buying copper pieces for this reason. Most people imagine that copper is like silver items, requiring chemicals to effectively clean and polish it. Actually, though, copper is quite easy to clean and polish without commercial chemicals, using ordinary household cleaners and a few other household materials. Is It Lacquered or Unlacquered? How you clean and polish copper will depend on whether the metal is coated with a protective coat of lacquer or if it is bare copper. If you polish a lacquered piece, you can ruin the protective finish. Unlaquered, plain copper can be cleaned and polished more rigorously. Does the piece get dusty or grimy without changing color or turning brown? Does the piece have a glossy, shiny finish instead of a subtle glow? If you answered YES to either question, your copper piece has a lacquered finish, and you should follow the next piece of advice. If the answer is NO to both questions, jump down to the section on unlacquered finishes. Wash the piece in warm—not hot—soapy water. If you must scrub the piece to get rid of grease or grime, be gentle. Use nothing more abrasive than you’d use on the non-stick coating of a favorite skillet. Take your time: gentle slow scrubbing is much better than harsh scrubbing. Dry the piece completely with a clean, soft cloth. Note: If you prefer, you can remove the lacquer, and then clean your piece using the method for cleaning and polishing unlacquered copper. This might be the best option if the lacquer finish has already started to peel away or is otherwise damaged. But be aware that after you remove the lacquered finish, you’ll have to clean and polish your copper piece regularly to keep it tarnish-free. Cut the lemon in half, and dip the cut end into the appropriate salt. Scrub the copper piece with the salt-covered lemon, using circular motions, until all the tarnish is gone. Squeeze the lemon gently as you work to force more juice out, and reapply salt to your cut lemon as needed. If you’re cleaning cookware that has a brass handle, use the salt and lemon to clean the brass parts, too. Rinse the copper piece thoroughly with warm water. Dry the piece with a soft cloth or towel. Using a second dry, clean cloth, buff the copper using circular motions to polish the piece to a soft glow. The more you buff, the shinier the finish.